Ever since I bought my first air plant, I absolutely love having them in the house. I’ve had my ups and downs with them (and I’ll definitely share my tips on how to take care of them in the future), but today I want to share a quick and easy DIY on how you can make a wooden hanger for showing your air plants off in what I think is an awesome way. You don’t need a lot of materials for this DIY and all things considered, making three of these hangers cost me less than €10. First, you need to find yourself a piece of wood. I got myself some slabs of wood when my father was trimming down one of our trees, so there’s no need to run to the store for this. Ask around or find yourself a thick branch somewhere. When you have your wood, you need to cut it up in slices. Mine are all about 2 cm thick. I didn’t do much cleaning on them. Apart from wiping down the tree bark a bit and sanding them slightly, I didn’t do much. I really liked the rough texture of the wood, so I wanted to keep it visual. Next, you need to drill two holes in each slice of wood you want to use. Measuring with the leather cord and the air plant I wanted to use, I figured out where the holes should go on one slab of wood. I kept the distance from the edge of the slice to the holes even through all my slices of wood (as I felt this would make them look better in a group). I also made sure that the thickness of my leather cord and the thickness of the drill I used were about the same. Now it’s time to fit your cord onto the slice of wood. My leather cord and the holes I drilled are about the same size. This means putting the cord through asks for a bit of patience, but it also means the cord won’t slip out too easily. In fact, I didn’t need to add knots on the end of the cords, because it’s stuck enough by itself to keep an air plant in place. I placed my air plant between the cord and the slice of wood to measure how much cord I needed for each plant. As you can see, there is no glue or anything else to keep the cord in place. You can, of course, hammer the cord in place with a u-shaped nail (or even hot glue), but I didn’t think this was necessary. I also liked that I was still able to adjust the length of the cord to my air plant. If I put a smaller specimen on the slice of wood I can just pull the cord a bit tighter. Finally, as a finishing touch, we still need to add a triangle picture hanger to our slice of wood. Get out your hammer and hammer away! Be careful though, because those are very tiny nails (and I definitely hit my finger more than once). And that’s it! 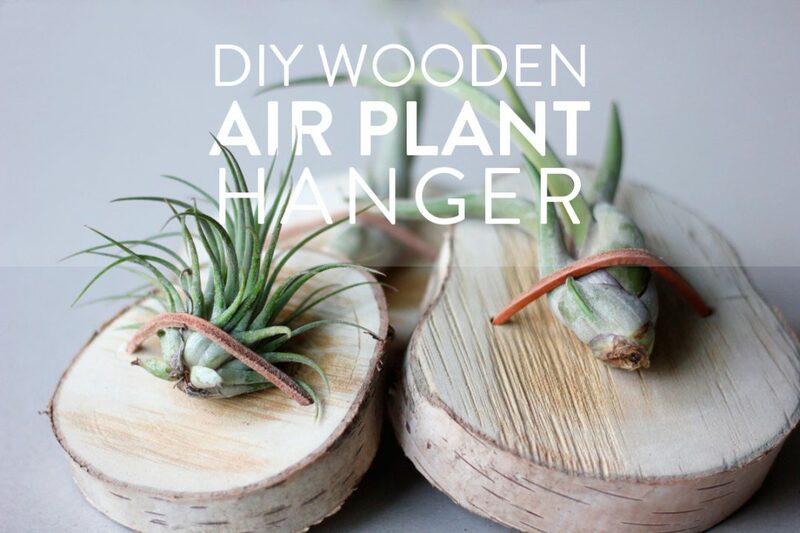 That’s how simple it is to create your own wooden air plant hangers. It only took me 30 minutes to make all three of them. If you’re wondering where I keep them in my house: there above my desk, next to my computer screen (on a very blue wall, which is the worst background for taking pictures). But I still love them there. Do you love air plants? How do you keep them around? Also mounted to the wall? And please tell me if you liked this tutorial. I felt it was awfully simple and I was unsure if I should even publish it. Wat een leuk idee. Luchtplantjes staan nog steeds op mijn verlanglijstje en met deze diy erbij wordt het straks helemaal leuk!